How Does a Reverse Osmosis Technology Work? One of the most commonly used water treatment systems in bottled water plants in India is the RO or reverse osmosis system. In this article, we will talk about what a reverse osmosis technology is and how it works. The reverse osmosis system is a technology that uses a multi-stage purification process to eliminate a large majority of contaminants to produce safe potable water. 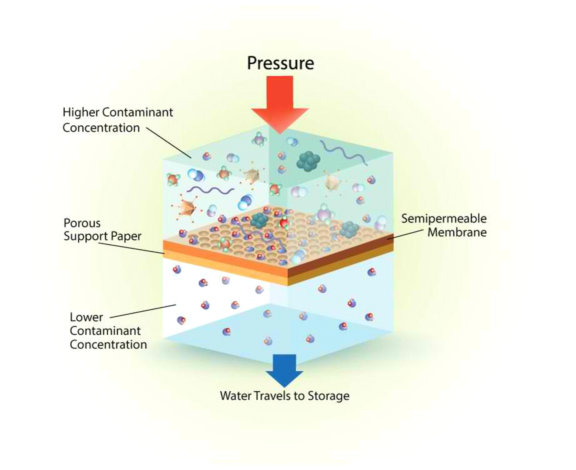 Water purification can be accomplished by pushing the tap water under pressure through a semipermeable membrane. How does RO system work? To produce clean drinking water that is safe for human consumption, the reverse osmosis technology filter out the impurities that are present in raw water by having it pass through a semipermeable membrane in a reverse flow- from a concentrated solution to a more dilute solution. The pre and post filters incorporated with the reverse osmosis membrane has a pore size of merely around 0.0001 micron. The RO membrane filters out water contaminants by rejecting them according to their charge and size. Those contaminants with great ionic charge and those with a molecular weight that is over 200 cannot pass through the reverse osmosis membrane. However, in order to make sure that the RO technology can successfully and effectively filter out 99+ percent of feed water contaminants, you need to ensure that it is well maintained and working properly. The RO system, however, cannot remove the gases like carbon dioxide. Instead of filtering it out, the CO2 will be converted to carbonic acid. This explains why permeate water has a pH level that’s slightly lower than normal. 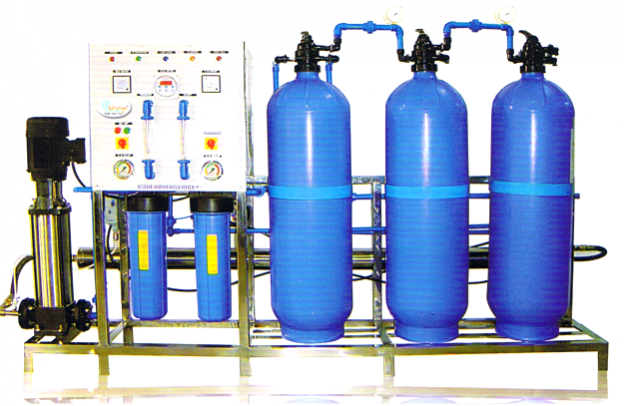 Why many businesses and households prefer RO system over other water treatment methods? There are virtually many options available for treating contaminated water like reverse osmosis, simple filtration, ozonation, mineral injection system, distillation, micron filtration, and Ultraviolet (UV) light exposure, to name a few. Of these water purification/filtration methods, one of the best and the most popular choice among households, businesses, and bottled water plants is the RO system. But why is this so? RO technology is not only one of the most effective water treatment methods available, but it is also likewise less expensive and easier to maintain, clean, and service than the other methods, with merely very few replaceable or moving parts. This makes the mineral water plant cost more affordable especially for start-ups. The bottled water that went through a reverse osmosis system also tastes and smells better. This entry was posted in Reverse Osmosis and tagged bottled water plants, bottled water plants in India, mineral water plant cost, mineral water plant project, mineral water plant project cost, Reverse Osmosis, reverse osmosis technology, RO or reverse osmosis system, water treatment systems on December 7, 2018 by Bottling India.